Despite Facebook planning to ban any promotion of ‘white nationalism’ on its platform in the wake of the New Zealand mosque shootings, nothing seems to stop fake left ‘anti-fascists’ using various social media platforms to threaten political rivals. With local elections just over a month away, a For Britain rally in Essex to launch their local election campaign came under fire from various fake left ‘anti-fascist’ twitter and facebook accounts. The accounts exposed the venue and asked followers to ring the owners demanding the rally be stopped. They also asked people to protest outside the venue, though nobody it seems turned out to oppose the rally. The rally was organised by Eddy Butler, a former BNP election strategist, who is now a member of the party and included party leader Anne Marie Waters as the main speaker. Although another breakaway party from UKIP, For Britain is regarded by many observers to have the best chance of making electoral waves over the coming months and years due to the political establishment’s failure to control mass immigration and deal with militant Islam. Although the multiple threats made against the For Britain rally turned out to be mere internet bluster, more serious threats have been made against Generation Identity activists who attended the Brexit Day rally in London on Friday, the 29th of March. A pro-Antifa account posted a picture of what purports to be the aftermath of an assault on a Generation Identity activist, though the incident doesn’t seem to have been verified or even reported to the police. 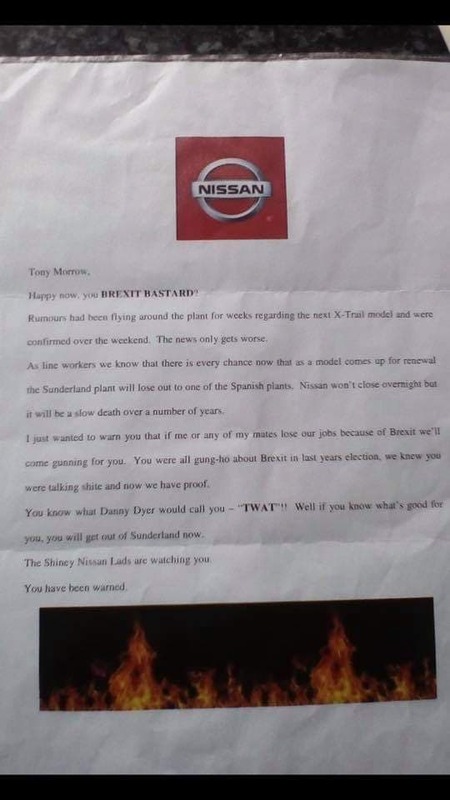 While in the north east of England, a letter was sent to a prospective local election candidate for the Populist Party in Sunderland pretending to be from workers at the local Nissan factory angry about Brexit. In the past, fake left ‘anti-fascists’ have engaged in COINTELPRO-style stunts against election candidates from patriotic parties and this seems to be a revival of those tactics by state-funded groups. Fake left ‘anti-fascist’ letter threat against local election candidate in Sunderland.